The best cure for lack of inspiration is travel; it's really helps to broaden your perspective; it also enables you to see what the world offers behind the walls of the "sound-bite" nation. Why else leave the comfy confines of my home here in San Diego to venture far into the interior of Baja. There was something I wanted to uncork for myself in venturing down to old Mexico. I looked at this impromptu opportunity to go on a press-trip as not only a way to escape unprecedented cold, rainy weather which was just about ready to descend upon San Diego. It was also good opportunity to grow as a writer, while at the same time discover for myself America's wonderful neighbor to the south, to experience how different their world is from my own home, but yet so similar. Helping me frame in my mind my principal reason for accepting this opportunity of discovery is Marcel Proust who said; “The real voyage of discovery consists not in seeking new landscapes but in having new eyes.” His words are piercing, cutting most of to the quick if the truth be told. Before we can see the world in which we wish to travel, we need to have “new-eyes”. It’s far too easy for average Americans; [myself included] to buy into our “sound-bite” culture and paint with broad strokes that which we think we understand about the places and peoples of our tiny world. If there is one thing that I’ve learned from my travels of late, you got to take the rough with the smooth. 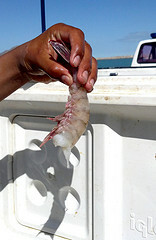 A small group of bloggers was invited down by the Baja State Tourism Office to visit San Felipe during their annual Shrimp Festival. San Felipe is located on the Sea of Cortes side of Baja and about a four drive from TJ. It’s a great place to visit, many Snow-Birds find their way their each year during the winter months. Some folks [known as ex-pats] like it so much they’ve taken up a permanent residence, building a wonderful community which brings needed employment to many. The beaches are beautiful, the cabana’s bountiful and you’ll find many overnight camping sites for the adventurous. For many folks San Felipe is a great place for off-road lifestyle; making it a great jumping off place for those activities. If you love fresh seafood, especially shrimp then you've come to the right place, you can eat and drink like a king for nearly a paupers price. Was I bit worried about traveling to Mexico? Yes, I can not lie, there was a bit of hesitation, a moment of pause, thinking what am I doing? We all have heard the stories about some of the bad things happening in Mexico. Honestly though, I never felt like I was ever in any kind of danger at all. We passed through many check-points on the way to San Felipe, with plenty of soldiers providing over-watch to the unsuspecting traveler. Okay maybe there was a few white-knuckle moments; which came in the form of a sometime harrowing drive down the steep barren hills of the La Rumorosa [“the whisperer”] and as our group drove across the open desert below, passing through a sand-storm which blanketed highway so much it was hard to see the oncoming traffic. So what did I learn from my trip, what were the take-aways? My experiences there, showed me San Felipe [a great sea-side town] is easy going come as you are kind of place. If you learned a little Spanish-lingo before you came down for a visit, it would help enhance your experience, but sparing that, even my basic Spanish skill got me by. The many ex-pats you encounter are wonderful salt of the earth folks, who are very welcoming of travel newbie’s, as I was invited to sit and have drinks with a few just to chat. I also made some great new friends who were on this press trip with me, you should check out their work; 52 Perfect Days, My Burning Kitchen and Menu in Progress. They have some great perspectives on the trip that you should not miss. I felt safe walking the streets at night, much the same as walking the streets of San Diego at night, taking the right precautions, with a dash of common sense. Lastly it made me consider, taking my next vacation south of the border. I unfortunately didn't have too many encounters with the rapidly developing wine-scene in the Guadalupe Valley, [La Ruta Del Vino] but it's something to look forward in the near future. I want to give a decanter full of thanks to the Baja California Tourism board, San Felipe officials and Allison & Partners P.R. for this great opportunity to experience Baja and the wonderful folks that call San Felipe home. Until next folks, sip long and prosper cheers! Hey Bill, I had the opportunity to do a little wine tasting in this region. Mexico is quickly disregarded for wine for many reasons. I won't pretend like I had any out of body experiences in my occupation of any of the wines, however, I bought some. My first time doing a wine tasting, followed with brandy and tequila. That was a real surprise! The people were amazing! The atmosphere was fun and different. The wines were very inexpensive. Most under $10. I was told the reason most people do not know about these wines is due to the fact that they sell everything in Mexico, and do very little exporting. Many are small mom & pop family wineries. Glad to hear about this trip and that all was safe! I hope to visit again! Bill, first of all a great thanks to you for saying those great words about San Felipe as many of US people still think that traveling down south to Mexico is dangerous. But, I say San Felipe is as safe as any other place in US and to this I'm a proof. I'm a Property Manager and beach front rentals operator in San Felipe for over ten years, but i actually belong to Oregon US and moved here 10 years ago. San Felipe has been transformed to a beautiful tourist destination with beautiful beaches, vacation rentals, golf condos, fresh sea foods and many more.